A drag link connects the pitman arm on the steering gear with the steering arm on the spindle. Rotation of the steering gear input shaft causes the pitman arm to rotate back and forth. As this motion occurs, the drag link pushes or pulls the steering arm causing the wheel to pivot on its king pin. Features and Benefits: Drag links are designed to accommodate the heavy loads encountered by trucks, buses and off-highway equipment. We provide nonadjustable or adjustable styles in several configurations. Solid, one piece drag links povide maximum strength and rigidity. These are recommended for heavy duty trucks. Tubular versions have separate ball socket assemblies staked in place. The relative angular relationships of the ball studs vary to suit the O.E. vehicle builder’s requirements. 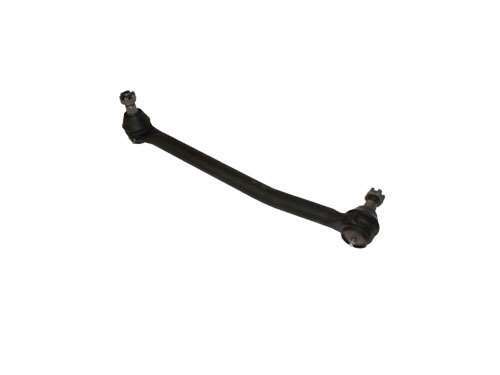 Adjustable drag links provide the ability to fine tune steering linkage systems for precise control. The links function much like a turnbuckle. All ball sockets are either staked or clamped. The ball sockets are of the same dual bearing, low end movement design as Dayton Parts’ tie rod ends. All are designed to withstand tremendous punishment while provieding maximum service life. For inspection station purposes, place the vehicle out of service if lateral movement (using hand pressure only) exceeds 1/8″. Do not use leverage as this will overcome the preload spring.